College baseball’s opening weekend is in the books and now it’s on to the grind of the regular season. We got to see a ton of baseball and a lot of teams at the third annual Big East/Big Ten Challenge in St. Petersburg, Clearwater and Dunedin over the weekend, so we thought we would share some observations, insights and numbers from a weekend that saw 24 games played in beautifully sunny weather. 3-0…Records by Louisville and Michigan State at this year’s Challenge. It’s the third straight year two teams have finished unblemished, but it’s the first time each conference has had a 3-0 team. Louisville and St. John’s both did it last year, while Michigan and Ohio State accomplished the feat in 2009. 19…Years since Michigan State last started a season with a 3-0 mark. Head coach Jake Boss, Jr.’s team sported a .343 batting average, 2.42 ERA and .981 fielding percentage (2 errors) to start the 2011 campaign. .667…Batting average by MSU centerfielder Brandon Eckerle to tie the Challenge record. The senior earned MVP honors after going 8-for-12 in wins over Notre Dame, Seton Hall and Cincinnati. 6…Pitchers used by the Spartans in their three games. Starters Kurt Wunderlich, Tony Bucciferro and Andrew Waszak combined to allow seven runs in 17 1/3 IP. 0.67…ERA turned-in by the Louisville pitching staff-a new single Challenge record. The Cardinals allowed a total of three runs in their wins over Michigan, Ohio State and Minnesota. The Cardinal staff pitched 23 straight innings without allowing a run. Understandably, Ian Dooley, who announced Louisville’s win over Ohio State here on Collegebaseball360.com, called the Louisville staff the best one he saw all weekend. 13…Strikeouts by the Louisville staff, including eight by starter Matt Koch, in the 6-3 win over Michigan. The 13 Ks are the third most in a Challenge game by a pitching staff. Louisville pitchers fanned 27 with eight BB in 27.0 innings over the weekend. 2…Errors committed by Louisville all weekend-both in the same game by shortstop Alex Crittendon, who was one of a handful of freshmen making their debut for the Cards. 32…RBIs in three games by St. John’s en-route to scoring 34 runs. The 32 RBIs is one away from the Challenge record set by the Red Storm in 2010. 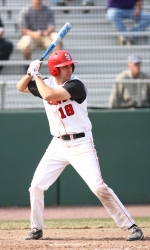 The Johnnies batted .383 with 11 doubles, two triples and a home run over the weekend. 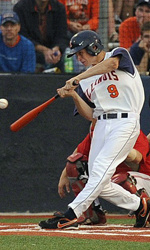 They were paced by 2010 National Freshman of the Year Jeremy Baltz, who was 7-for-14 at the plate with five runs and seven RBIs. 7-2…Three year record posted by St. John’s in the three years of the Big East/Big Ten Challenge, after going 2-1 in 2011. 2…Earned runs allowed by Red Storm starting pitchers Matt Carasiti, Sean Hagan and Brendan Lobban in 15 1/3 combined IP. The bullpen combined to allow 11 ER in 15 2/3 innings. 7-1…Lead the Red Storm blew in Sunday’s 8-7 loss in 11 innings to Ohio State. St. John’s was held scoreless over the last eight innings after jumping out to the early lead. It was the first win of the Greg Beals era at OSU. 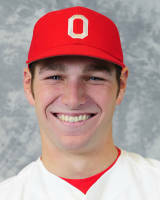 2…Shutout innings pitched by Ohio State freshman Josh Dezse to earn earn his first collegiate win. It was his second relief appearance of the weekend for the Buckeyes. .583…Team-high batting average by Dezse (7-for-12), who was also the Buckeye’s starting DH in all three games. His batting average is the third-highest in the Big Ten after opening weekend, while his .111 opponent batting average ranks third in the conference. .545…Team-best batting average by Cincinnati freshman Justin Glass (6-for-11), who collected four of the hits and an RBI in his team’s season-opening win over Ohio State. .156…Batting average by Minnesota en-route to a 1-2 weekend. The Golden Gophers managed just three doubles and a triple, while committing eight errors. Nick O’Shea, who hit .456 with 6 RBIs, was one of the few offensive bright spots. 12 1/3…Total innings pitched by Minnesota’s three starting pitchers. Phil Isaksson gave-up just a run in 5.0 IP in his no-decision in the head-to-head match-up against UConn All-American Matt Barnes in Minnesota’s only win. 11…Strikeouts by Barnes in 6.0 IP, while suffering the loss in that game. Barnes set the Challenge single-game strikeout record in the Saturday start, but Friday starter Elliot Glynn surrendered 3 ER in 4 2/3 IP in UConn’s season-opening 10-2 loss to Purdue, in what was the upset of the Challenge. Glynn’s stuff looked good, but he appeared to overthrow at times, with three walks and two hit batters in the loss. 5 2/3…Scoreless innings pitched by Purdue’s Matt Morgan in the upset of the Huskies. The senior struckout five and allowed just three hits to earn the win. 11…Pitchers used by Purdue in three games-the most of any team at the Challenge. The Boilermakers ended the weekend with a 6.00 ERA. 19…Runs scored by Notre Dame in its 19-2 Saturday win over the Boilermakers-a new single-game Challenge record. It was also Mik Aoki’s first win at Notre Dame. 3…RBIs on a double by Irish outfielder Herman Petzold to spark an 11-run fourth inning in that game. Petzold is a fifth-year senior who had three hits and no RBIs in his first four years at Notre Dame. He finished the weekend by going 5-for-12 with three runs, two doubles and five RBIs in the first three starts of his career. 0-3…Record by Michigan at the ’11 Challenge. The Wolverines had by far the toughest draw of any team at the event, with losses to Louisville, St. John’s and Connecticut. .311…Team batting average for the Wolverines, but the pitching staff had a 9.00 ERA. Starters Brandon Sinnery, Bobby Brosnahan and Ben Ballantine combined to allow 12 ER in just 10.1 IP, while the Michigan defense committed six errors. 4…Times hit by pitch by Seton Hall’s Will Walsh in Friday’s 8-6 loss to Penn State-one away from the single-game NCAA record held by former Stanford OF Carlos Quentin. Penn State starter Heath Johnson accounted for five of his team’s Challenge record seven hit batsmen in the contest. 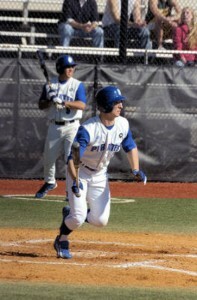 PSU pitchers hit nine batters in three games, while Seton Hall pitchers plunked one batter all weekend. 4…Wild pitches by Seton Hall pitchers in that game-also a Challenge record. 2.77…Team ERA for a Penn State team that hit just .240, while going 2-1. However, seven Nittany Lion errors allowed eight unearned runs to score. Starting pitchers Steven Hill and John Walter combined to allow just four earned runs in 15 1/3 IP. 2.42…Staff ERA for a West Virginia team that is traditionally strong on hitting and thin on pitching. Mountaineer starters Jonathon Jones and Harrison Musgrave combined to allow no runs with 13 Ks, five hits and no walks in 13.0 IP. 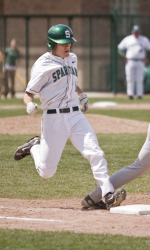 4…Stolen bases in three games by Illinois shortstop Josh Parr-a new Challenge record. His biggest steal came in the top of the 9th inning of Sunday’s 5-4 loss to West Virginia. After stealing second base with two outs, his brother, Justin Parr, drove him in to tie the game, but WVU plated the winning run in the bottom of the inning. 40-38…Head-to-head record of the two conferences in the three years of the Big East/Big Ten Challenge, with the slight edge going to the Big East. The Big Ten took the first Challenge 15-9, but the Big East won 17-13 last year and 14-10 this year. 20,064…Total viewers who joined us to watch 13 2011 Big East/Big Ten Challenge games webcast here on Collegebaseball360.com. Thanks to everyone who watched and thanks as well to both conferences as well as Angel Natal from the St. Petersburg/Clearwater Sports Commission and Bo Carter from the NCBWA!